The Picasso Stencil Tool was designed by Lynell and Wayne Harlow, founders of Dreamweaver Stencils, to address many issues with stencil techniques. It's called Picasso because the resulting shape reminded Lynell of Picasso's Guernica painting. We've created a handy worksheet of ideas, you can find it by clicking HERE. The tool has many unique corners, angles and curves for masking small spaces while stenciling with brushes or adding glitter. There are several round openings of varying sizes for adding eyeballs, snow flakes, definition and just fun dots where needed. Raindrop shaped holes in two sizes help you add rain, dew, or tears to any project. Several curved or straight openings allow you to add veins to leaves and flower petals, or detail wherever it's needed. 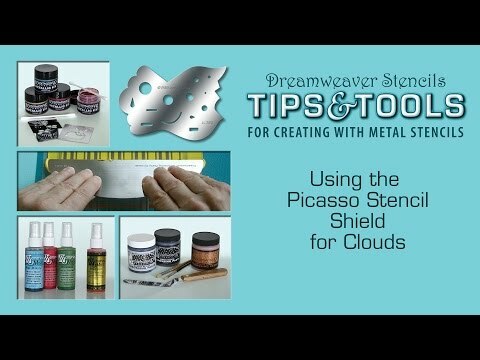 The rounded edge is perfect for stenciling clouds with stencil brush or sponge dauber. The smooth curves are ideal for drawing hills and valleys on your project. Use tape to cover unneeded holes. The uses are endless! Click on one of the projects below for more instructions. Click on one of the projects below to learn how the different Picasso Techniques work.